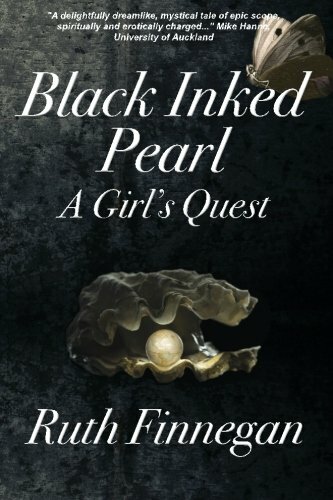 Article first published as Interview: Ruth Finnegan, Author of ‘Black Inked Pearl: A Girl’s Quest’on Blogcritics. Ruth Finnegan was born in Derry, a beautiful and fraught city in Northern Ireland, and grew up there, apart from a few years in the magical setting of Donegal (described in her novel). Then after learning so much about literature, music and drama at Quaker school (where she was a schoolfellow of Judi Dench), she went to Oxford, where she, to her surprise, did well in classics, then Anthropology. After fieldwork and university teaching in Africa, Ruth returned to the UK to the new Open University where, except for 3 years in Fiji in the South Seas (an amazing place which in the end she couldn't help writing about), she stayed until she retired, and is now an Emeritus Professor. She has published several academic books (about 20), and one novel. Ruth is lucky enough to be very happily married, and she and her husband David recently celebrated their Golden wedding anniversary! They have three wonderful daughters and five grandchildren, one in New Zealand, which is where her novel first began and was largely written. She lives with her husband and two Cairn Terriers in Old Bletchley in England. Ruth feels that now, at 82, she has led an enchanted life, with still much more to go! Sheri: Welcome Ruth, and thank you for being here today. Can you start by telling us a little bit your journey to becoming a published author? Ruth: I first started publishing because well, I kind of had to. I had been given a grant by the Colonial Office to do a study in Sierra Leone in West Africa, which at that time (1960-61) was still a colony, and of course had to write a report at the end of it, which they opted to publish in their 'Colonial Development' series. And there it was in its smart yellow dust cover - my first book! After that, it was taken for granted that I would turn my Oxford doctorate into a book, Limba stories, and storytelling. So that was that too (had worked hard at it, mind you). And, it just went on from that - the natural thing for a university academic. But, I guess you're more interested in how and why I became a novelist. Well that was also not really a conscious process, though I did get a job along the way from a wonderful American literary mentor named Mark Malatesta, who told me that short novellas weren't much good, and I needed to frame my thoughts into a proper full-length book. At that point, my dreams started to come thick and fast; visions they'd probably have called them in the Middle Ages. At first, I thought of them as visual - visions: that's how we normally think of dreams isn't it? But, now I think of them more as intensely-experienced nodes of feeling that are non-verbal, with the words somehow gathering around the edges of my brain without any conscious effort on my part, as night after night I lay in that magical liminal state between sleeping and waking, when the mind is somehow open to eternity. The novel just seemed to be standing there, already in being, waiting for me to see and take it. Maybe it was first written - or dreamed, or imagined, a thousand years ago and was just there waiting for me (as in another dream I had) to publish it to the world of today. Then, soon after each night's dreaming, I wrote it down - fast, as if from dictation, sometimes hesitating over the paragraphing or spelling, but never changing anything. I never forgot anything until it was written down. Since it was already fully there, somehow by another's hand, I knew I mustn't change it. Having got it into 'black ink' print, I then forgot all but the basic lines of the plot, those that are summarized in the synopsis. Remarkable! That took seven weeks flat, a chapter a night. The last, (50th) chapter was later - but I think it had been there all the time, I just hadn't seen it before. The poems came separately, earlier (I think). They too came ready-made, their rhymes, rhythms, thought and resonances already there. It was amazing. I thought at first they were independent and wondered whether I should publish them as a poetry collection (if I dared - they are very intimate). But then I saw that they belonged to the novel so, as it were, I dropped them into the slots that were, somehow, waiting there for them. Once written that was pretty much it. We made a few changes during the copy-editing with marvelous Garn Press - but these changes were minimal. It was ready. Sheri: Amazing! Tell us, what is Black Inked Pearl about? Ruth: Love. The world. Dreaming. My own life (sort-of). On the face of it, it is the forever-recycled tale of a girl's quest for the love she rejected (in this case in a panic on a Donegal strand in the first chapter). Then, sort-of like the journey of the soul spends her life seeking. Only after she has forced herself to accept his incredible sacrifice to save her can she finally find herself - the pearl of the title. But, in ways I can't quite grasp myself, it is more than just that surface story; perhaps you can read it and tell me what you reckon that - for you -it is about. It is fascinating to me that, as with classic literature, each reader, each reviewer finds something different in it, often bringing out dimensions I had not myself been aware of. Sheri: What are Kate’s biggest strengths and how do these help her on her journey? Ruth: Perseverance, (she’s a Capricorn, like me), and LOVE enduring against all the odds. When forced to it to save her life, she is also prepared, in the end, to sacrifice herself - her deepest character; her upbringing; her school-embedded ways. For her (and people like her) the hardest thing of all (almost a spiritual thing) is to ACCEPT someone's sacrifice. Having all her life been a GIVER, Kate finally, with the utmost difficulty, has to allow herself to be given-TO. Only then can she find her true self, the 'pearl' that was sought all through the black ink story. Sheri: What is the main message you hope readers take away from Black Inked Pearl? Ruth: That we are right to puzzle about the ambiguity between dream and reality, conscious and unconscious, rationality and 'madness'. Also, that we should value the seekers for the impossible, the experiencers of dementia (perhaps they see further than we realize? ), and the dreamers of dreamers. Sheri: Our reviewer said Black Inked Pearl is “…destined to be a classic novel.” That is certainly high praise! How do you feel about that declaration, and what do you think qualifies a book or series to become a classic? Ruth: What an amazing thing to have said about one's book! Beneath a surface attractiveness and meaning(up to a point), readers find many different layers of meaning and personal interpretations - as I say, just about every review brings out a different dimension (often things that I had not myself been aware of): complementary not contradictory, there is no ONE message. There is somehow something universal about a classic work, which readers resonate with, something not tied to just one particular time or background. It remains with you after you have finished reading; you have learned/experienced something new from it. As one reviewer put it, it somehow 'sinks into your unconscious' - or just, as another reviewer put it, 'Wow'. People want to reread it, and then get more from it each time – inexhaustible. Suitable, for all these reasons, for college/university study where people can dig down into many layers (this has been pointed out in several comments, including, but not only, by people who, saying they were looking for something lighter, not a university text, did not like the novel). It relates to and draws readers into other realms of western literature and thought. It is relevant to the great issues of today, and of all time - personal identity, sacrifice, the spiritual, the nature of 'reality' and above all for love. Creative/new in genre (it is a kind of mixed genre, near-unique - I say 'near' as it is reminiscent of some recent African novels), style (poetic, sonic, oral, continuity between prose and poetry), origin/source (in dreams) and language (unusual, playing with words and grammar). None of this is unparalleled but the combination is, at present anyway, unusual, maybe unique. But in the end I really don't know quite what to say. The whole thing is still so mysterious to me - both its arrival in the first place as a kind of unforeseen gift and the many dimensions I hadn't myself seen but have been pointed out (rightly I now see) by reviewers. Sheri: Do you have one piece of advice you received that marked the turning point in your writing career? Ruth: Yes, from my mother: keep your paragraphs short, and cut out all the big (especially the Big) words. Sheri: What advice would you give to aspiring authors? Ruth: Well, do listen to what people tell you, read lots of literature both great (especially), and not so great (lots to learn there too), and the kind of books people look down on (why? they might be wrong). But, beyond all that and above all, go with the flow - that is, with YOURSELF: how you think, see things, above all FEEL (even if, especially if, it's not the way you're supposed to feel, or the genre you're supposed to express it in). I don't think any serious novel can be anything but autobiographical by which I mean rooted in your OWN deeply felt experience, whether that is ''real' (mmm, slippery word) or imagined. And - always, always, always, read it ALOUD, if only to your inner ear, before you reckon it's finished. You'll find it amazing what you'll learn from that, (and that too will probably get you to shorten and cut up your paragraphs). Sheri: Aside from writing, what are your other interests? What do you like to do in your free time, assuming you have any free time? Ruth: I listen to music. Read 'silly' books. Sleep. Talk and eat with my husband and friends (I love beautiful food). Visit and walk in lovely New Zealand where one daughter welcomes me wonderfully each year, usually in their enchanted liminal autumn time; and, so amazing, learn from my grandchildren. I am so lucky. Sheri: What’s next? Do you have another project in the works? If so, what can you tell us about it? Ruth: Well another novel keeps trying to get to me, but so far, I've managed to fight it off! I have some academic books that I must finish first, they don't go away, and I love writing them, too. No, I'm not telling you any more about the infant novel, might it be stillborn anyway. Come back in a couple of years. But I will say it's related (but you'll never guess how) to Black Inked Pearl. Sheri: Is there anything else you’d like to share with our readers today? Ruth: Just – oh, like in 'The Alchemist' - follow your dream. Sheri: Before we go, can you tell us about your website, blog, etc., and what additional information can be found there regarding Black Inked Pearl? Ruth: Look at my Facebook author page. There's also quite a bit (or will be) on the Garn Press website of what I call ’Ruth’s Black Blogs' (black has somehow become my happy and decorative signature tune - not a sign of pessimism, far from it) at http://garnpress.com/authors/ruth-finnegan/. There is a list of most of my books on my Amazon author page, also bits and pieces elsewhere, like Readers Favorite and Goodreads. You might also enjoy the videos about Black Inked Pearl and its poems (Google Ruth Finnegan Black Inked Pearl video trailer on YouTube), also a couple of videos about my favorite academic books ('Communicating' and 'Why do we quote?'). A lot of my recent books (not all) can be found on the Lulu online bookstore, including a recent attempt at a kind of bio-compendium: Ruth Finnegan Anthropologist, a bit expensive though. There's also a website (www.open.ac.uk/blogs/music/?p=1365) reporting on the conference mounted in early 2016 to honor (amazing) one of my academic books, The Hidden Musicians (not as unrelated to the novel(highly sonic, aural, and rooted in music) as you might think). Sheri: Ruth, it has truly been a pleasure having you with us today. Thank you so much for stopping by and providing us some insight into your novel. I look forward to seeing more work from you in the future! Ruth: Thank you. Good reading - and don't forget the greatest of all poets, the Greek epic singer, Homer.